and tied the tray onto the stand through the suction cup holes with thin leather strips for extra support. And, in the spirit of upcycling, please read the following call for submissions from our friend Mahe whom you’ve met here and here and here. She has an exciting plan to get your projects and name out to like-minded crafters and artists around the world! My name is Mahe Zehra, but I mostly go by MZ. I am a mathematician by training but an artist by nature, so in addition to my day job at a software company, I have a small green crafting company of my own called Altered Upcycling. I chose this name because I think it explains my art style. I apply mixed media and altered art techniques to materials that are recyclable. I make art from paper scraps, soda cans, and plastic packaging. I have written several books and videos available on Amazon.com. My latest venture involves putting together a book that brings upcycling projects to and from crafters and artists from all over the world! The book will contain 35-50 tutorials, each accompanied by the submitter’s photo, a short bio, and any other links you want to promote. This book will be a great advertising opportunity, as I will be marketing it to my 5000-strong Facebook audience and my crafting mailing list as well as on my blog. In addition, I will run ad campaigns and offer free downloads on Amazon. Globally, the book will make its way to 10,000-20,000 readers! I would LOVE for you to be included in this book! All I need is a craft project that focuses on upcycling. The tutorial should have pictures or a video and clear, step-by-step instructions. Please sent your submission along with your photo, short bio, and links by Monday, July 22 to thecraftycan@gmail.com. Your table is perfect! It will last through winds (go right through it!) and rains (ditto)!!!! Way to go…..”table A-la-mode”…….she ‘strikes’ again!!!!! LOL!!!! I love your upcycled table idea, very cool! I’m looking forward to Panera! Love the table, it makes me want to take something apart and repurpose. Thanks for sharing MZ letter, it seems a fabulous idea. I’m certainly thinking about it…. I love the table. Thanks, Katherine for bringing this to my attention. Seriously one of the most clever ideas I’ve ever seen – ❤ it! very cute, what about a glass top? I will:) need to decide on project & spend some time improving the pics!! Smiling as I write this because I LOVE your new table. it even has sides so things can’t fall off. PERFECT. This was so clever. I love the use of a broken fan. That’s the type of thing you think “what in the WORLD can I do with this?” What a great idea! OH my gosh …. that is so CLEVER!! I just might break a table on purpose so I can make one…..
Now all I need is an old fan and a table without a top! I love the whole concept of upcycling and that table is brilliant! love what MZ is planning on doing with her book too! What a fabulous upcycling project! Love it! I love it!!! and that book has got to be good, I will check out her site. Thanks Katherine!!! 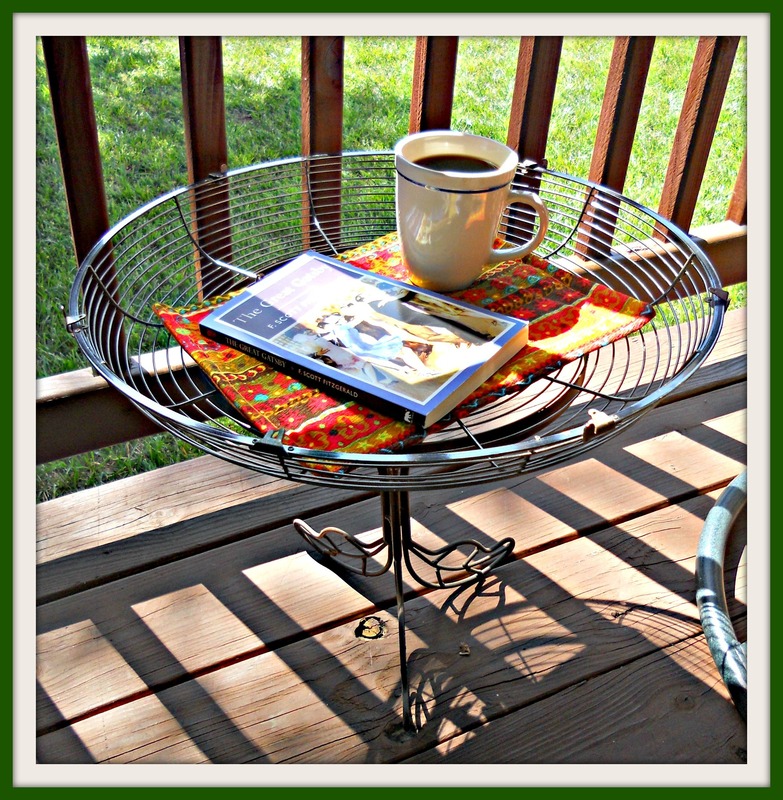 All Green Artisans this is a must read post..
What a lovely table! I like the idea of a sort of basket for the table top! This is too cool!!! Love it! You are a genius! Love the new table. What a great idea! Love the diversity of it too, could even hold fruit! Definitely! And hang things from it … ahh upcycling, such inspiration!